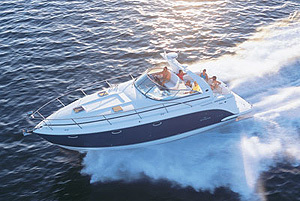 Rinker’s Captiva 246 BR is a big day boat with a feature not found elsewhere in Rinker’s runabout lineup. 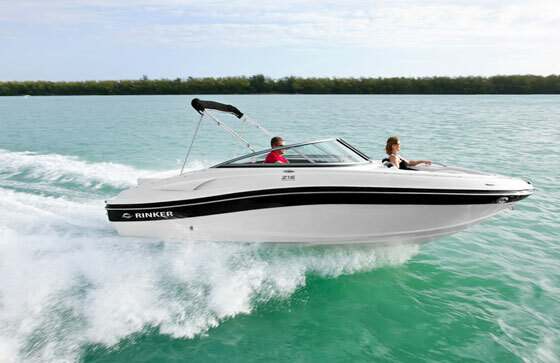 If you’re looking for a mid-sized runabout or bowrider, Rinker should be on your list with its new Captiva 246 BR. This company has been building boats in Indiana since the 1930s, and is the oldest boat brand in continuous production in the United States. It’s safe to say the people at Rinker Boats have been at it a while. 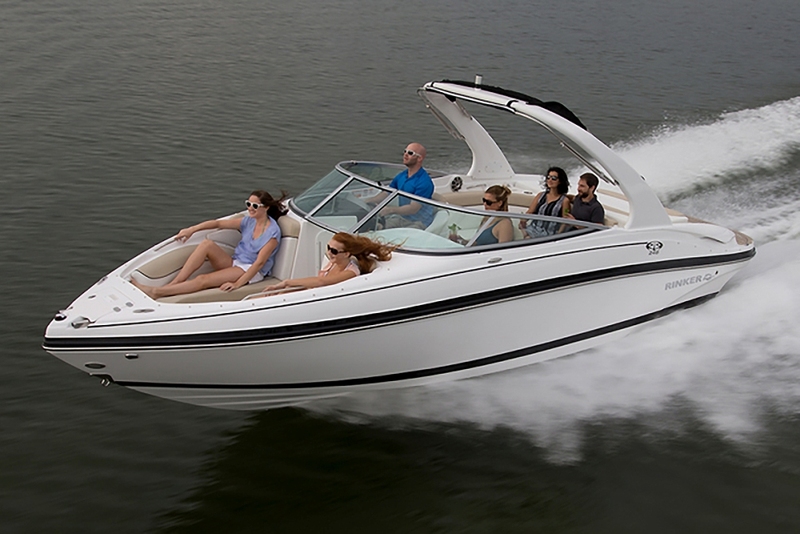 With this size once considered big in the bowrider market, today the Captiva 246 BR would be called a mid-sized runabout—but it’s still big on standard features. The Captiva 246 BR comes with a long list of standard features, including one, a walk-through to the swim platform, that doesn’t come on any other Rinker runabout. 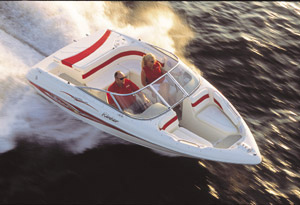 That makes the boat unique, as do some other features that come standard yet are often options on competing models. For instance, the 246 BR comes with bow walk-through doors, snap-in carpeting, and a transom shower with pressurized water. It also comes with flip-up bolsters, a cockpit sink, and a removable cockpit table. Tucked beneath the port-side cowl is a changing room with a portable MSD. 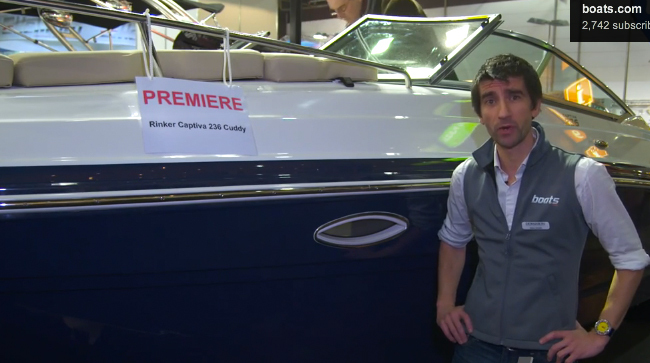 There’s even a Bimini top. All standard. To starboard, the helm is richly appointed with a platinum-color dash applique and contrasting black gelcoat. The gauges are splayed out logically so they’re easy to read at a glance. A (yes, standard) Ritchie compass sits atop the dash, also right where you need it. The bow is fitted with a receptacle for the table, two forward-facing lounges with gently-angled backrests, and grab rails tucked beneath the gunwale so as not to spoil the sleek profile. The bow also is home to integrated stereo speakers, cupholders, and stowage beneath the lounges. 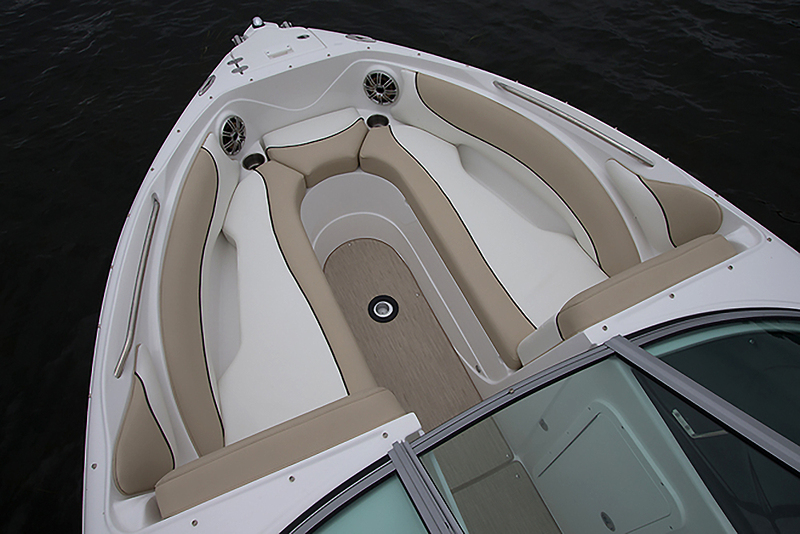 The bow is comfortable, stylish, and unlike many competitors manages to incorporate the bow ladder and anchor locker beneath a single hatch. At the stern, the 246 BR offers a generous swim platform with a two-up sun pad that converts to a rear facing lounge. The ladder’s offset to the starboard side, to keep feet and toes away from the propeller. Small-block power is standard, with up to 380 HP available in big-block form. Both single- and dual-propeller applications are available from Volvo-Penta and MerCruiser. (See Stern Drive Show-Down: Volvo-Penta Duoprop vs. Mercruiser Bravo III to help make your decision). 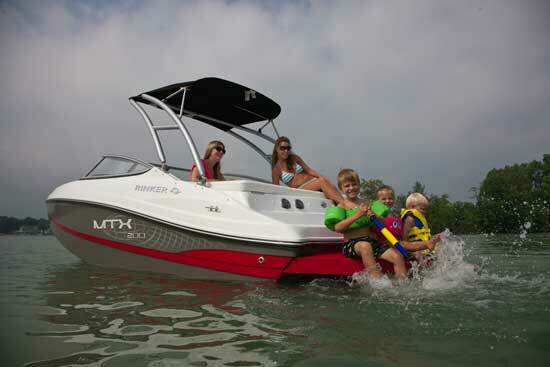 So, if a big runabout is what you’re after, put this Rinker on your list. 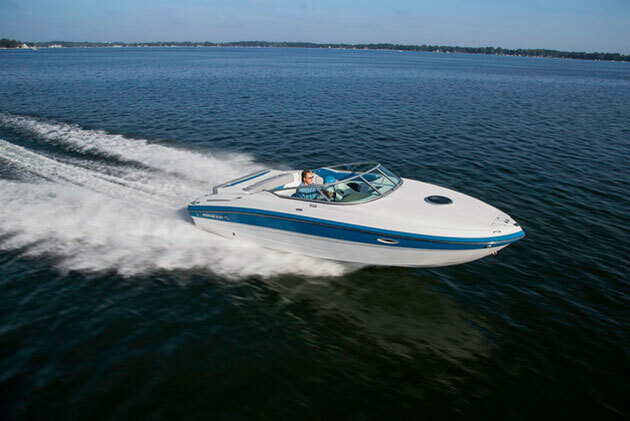 Even in standard trim it’s pretty well equipped, which is probably something Rinker has learned buyers want during its 70-plus years in business. 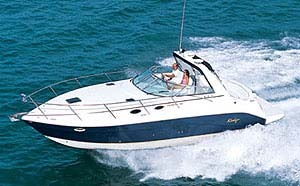 Other Choices: Another mid-size bowrider that comes with a solid list of standard features is the Cruisers Sport Series 258. A slightly smaller option would be the Monterey 234SS. And if you’re willing to spend a bit more for glitz and glam, check out the Cobalt R5. See Rinker Captiva 246 BR listings.